Seven weeks have come and gone in the NFL season and the sample size for PFF’s extensive data is growing, giving us a much clearer image of which players are standing out across all positions in 2017. In today’s pass-happy NFL, a smart quarterback, sure-handed receivers and pass-catching running backs are all important, but down in the trenches, stalwart offensive linemen are being counted on in arguably higher levels than ever before. That begs the question, who does the PFF data tell us are the best pass blocking offensive linemen across the three main positions after seven weeks? Hint, some of the names may surprise you. 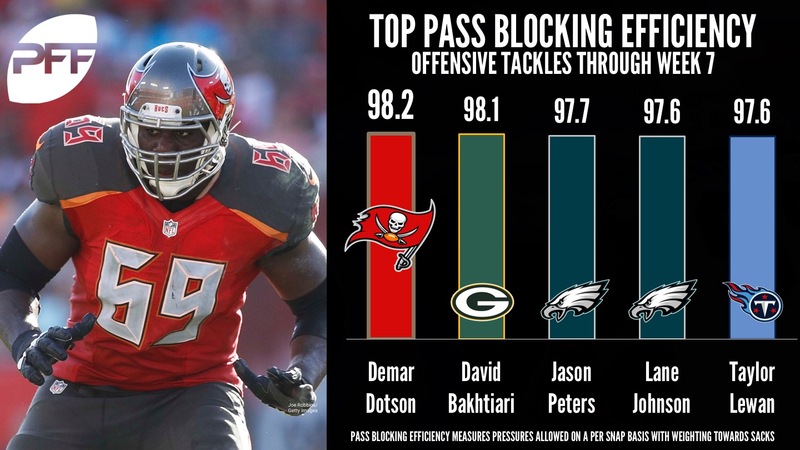 Tampa Bay’s Dotson has been among the better tackles throughout his career, however, he was able to take a step forward in pass protection this season. The Buccaneers right tackle is 1-of-8 offensive tackles who has recorded 100-plus pass block snaps, and have yet to allow a sack. Furthermore, he has allowed just six total pressures – two hits and four quarterback hurries – in six games and had three games where he did not give up a single pressure. As a comparison, Dotson had just one game last season when he did not surrender a pressure. Bakhtiari is tied with Dotson for the highest PFF grade among offensive tackles this season at 86.5, which is due largely to his work in pass protection. He had to miss some time and therefore has played just 94 snaps in pass protection, however, Bakhtiari has allowed just two pressures on these 94 plays – one sack and one quarterback hurry. Bakhtiari and Packers right tackle Bryan Bulaga established themselves as one of the best pass protecting offensive tackle duos in the NFL in past seasons, but will face a challenge in needing to adjust to the pocket movement and rhythm of a new quarterback in Brett Hundley. Unfortunately, it seems like Peters will have to miss an extended time with a knee injury he suffered against Washington on Monday night, however, he has been among the best pass protecting tackles through the first seven weeks of the 2017 season. Peters was on track to have his fourth clean sheet of the season against Washington as he had not allowed a single pressure against the Giants, the Chargers and the Panthers prior to Monday night’s game. The Eagles must hope Peters will be back for the playoffs as the left tackle was on pace to allow just 19 pressures all season, which would have been a career-low for him through an entire season. Despite Peters missing time, the Eagles will not be without an elite offensive tackle in his absence. Johnson, the second right tackle on this list, has always been among the best run blocking tackles in the league, however, he’s having his best season in pass protection in 2017. The former Oklahoma tackle is on pace to allow just 18 total pressures this season, which would be fewer than what he allowed in any other season except for 2016 when he played just 407 snaps. Johnson’s performance is even more impressive when we consider that he’s among the offensive tackles who get the least help from chip blocks and tight ends in the league. On the other end of the spectrum from Johnson, Lewan has been getting quite a bit of help by chip blocking running backs and tight ends. However, this does not take anything away from the fact that he has allowed just seven total pressures all season. While Lewan had a breakout year in 2016, he’s having an even better season in 2017 as he’s on pace to allow just 16 pressures in as many games, which would be 33.3 percent fewer than the 24 he gave up a season ago. 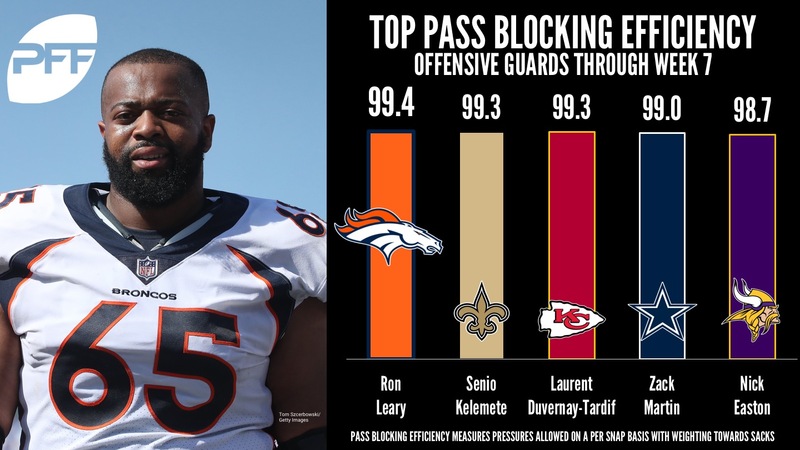 The former Dallas Cowboy has been known for his run blocking through his entire career, but in 2017 has taken a huge step forward in Denver in terms of pass protection. In fact, Leary had not allowed a single pressure in the first four weeks and is still yet to allow a sack in 2017. Leary is on pace to allow just six pressures this season, which would be a huge improvement from the 35 pressures he allowed on average in his previous two full seasons (2013 and 2014) in the NFL. Kelemete has now already logged snaps at left guard, right guard and right tackle this season and while he gave up two pressures on 26 pass blocking snaps at right tackle, he has surrendered just one pressure on 106 pass blocking snaps at guard this season. The former fifth-round pick might be pushed into starting duties at right guard with the injury of Larry Warford, but the Saints may not see a drop-off at the position at all. Kelemete played in the second half against Green Bay in Week 7 and did not give up a single pressure on 18 pass blocking snaps even though he went up against one of the best interior defender duos in the NFL in Mike Daniels and Kenny Clark. The Chiefs’ interior offensive line has slightly struggled in recent weeks, which is largely due to some key injuries along the offensive line. However, while most have mentioned the injury of center Mitch Morse, Duvernay-Tardif’s injury had arguably just as big an impact on Kansas City’s pass protection woes, if not bigger. The Canadian guard went down with a knee injury against Washington in Week 4, but was off to a great start to his 2017 campaign as he gave up just one pressure in the first three games against the Patriots, the Eagles and the Chargers. Duvernay-Tardif can be back on the field as soon as Week 8 and the Chiefs will need him as he is establishing himself as one of the best pass blocking guards in the NFL. Martin would probably be at the top of the list if people had to guess, and the former Notre Dame guard is indeed having another stellar season as he is the second-highest graded guard in the NFL with a PFF overall grade of 86.8. Martin has allowed a total of three pressures – without any sacks – this season and all three of them came against the Rams, including two against Aaron Donald, the best interior pass-rusher in the league. Martin is on pace to allow just eight total pressures this season, which would be his career-low after surrendering only 13 pressures in 2015. The Vikings were busy in free agency and during the draft to strengthen their offensive line, but the biggest improvement might have come from developing and moving Easton from center to guard. The former undrafted free agent started the first five games for the Vikings, and allowed just three pressures and no sacks on 173 pass blocking snaps. His development is even more impressive considering that the former Harvard player allowed a total of 12 pressures on 262 pass blocking snaps while at center last season, which is a position where players generally allow pressures at a lower rate. Even though Oakland’s offensive line allowed 11 sacks in the first seven weeks, Hudson has not been responsible for any of them. Furthermore, Oakland’s center had not allowed a single pressure in the first six games of the season, even though he was on the field for every snap. Although Hudson allowed one quarterback hurry against Kansas City, he still remains one of the six centers who have not allowed a single sack or hit in 2017. Hudson is on pace to allow less than three pressures this season while all other starting centers have allowed at least three pressures so far this season. The fact that Hudson is tied for the 11th most pass blocking snaps this season just makes his feat even more impressive. 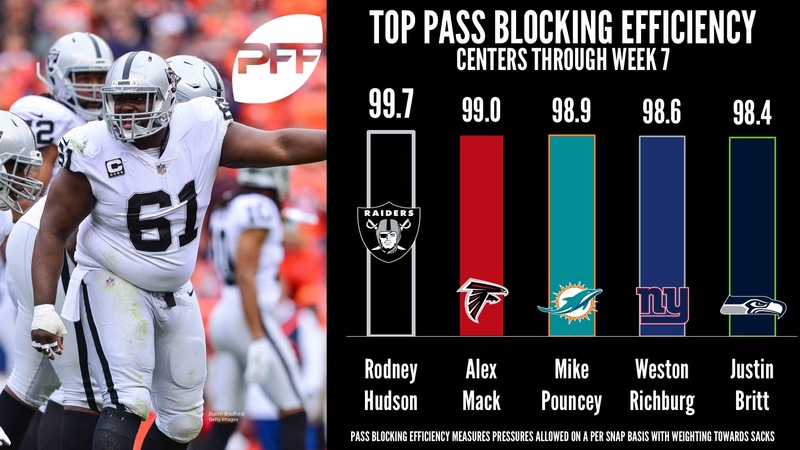 Mack leads all centers with an impressive PFF overall grade of 88.7 this year and while that is largely due to his run blocking, he has been among the best in pass protection too. Atlanta’s center had four consecutive weeks of not allowing a single pressure between giving up one in the season opener at Chicago and allowing two against New England in Week 7. Even though Mack’s 2016 season was widely praised for elevating the Falcons offensive line, he allowed three sacks and six hits last season, but has yet to give up a single sack or hit in 2017. Similarly to Hudson and Mack, Pouncey has yet to allow a single sack or hit and has just given up three quarterbacks all year – all against the Jets in Week 3. While Pouncey has already played more snaps in 2017 than a year ago, his has yet to match the eight total pressures – two hits and six hurries – he surrendered in 2016. Furthermore, the former Florida Gator is on pace to give up just eight total pressures, which would be just one more than his career-low seven pressures allowed back in 2012. Even though Richburg has been unable to replicate his strong run blocking from 2015, he had a solid season in pass blocking last year and is impressing in pass protection once again this season. Despite missing time with a concussion in recent weeks, he played in the first four games of the season and held a clean sheet in two of those contests as he did not allow a single pressure against the Cowboys and the Eagles. The former Colorado State center is yet to allow a sack this season and hopes to replicate that feat when he’s back on the field. Britt has been a pleasant surprise on an otherwise below-average Seahawks offensive line for the second straight season. The move of Britt to center paid off in 2016 as he did not allow a single sack or hit all year and while he has allowed one of those apiece in 2017, he has given up an additional three quarterback hurries this season. As a result, he is on pace to surrender one fewer pressures this year with him projecting to allow 13 total pressures compared to his 14 he allowed last year.